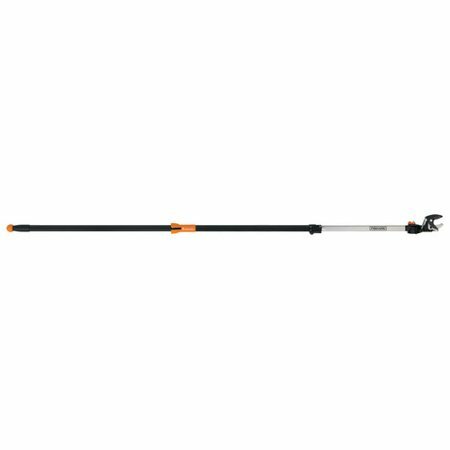 Fiskars Pruning Stik Extendable Tree Pruner, 8"-12"
The versatile, rope-free tree pruner extends up to 12 feet to take down high branches without a ladder or make low cuts without kneeling or bending. The Pruning Stik Tree Pruner makes it easy to cut high or low with a level of control traditional pruners with exterior ropes can't match. A long, lightweight pole lets you cut high branches without the hassles and dangers of using a ladder, make low cuts without sore knees from kneeling or back strain from bending and easily reach into dense, prickly shrubs or tight spots. For the reach you need to cut your highest branches, the pole extends all the way to 12' and locks securely. The rope-free design means you can use both hands to maximize your power and accuracy, and an easy-to-grip sliding handle makes the pruning action smooth and simple. An actuating ball at the end of the pole lets you reach even farther and still prune with precision, an included 15&quot; saw blade makes it easy to take down thicker branches, and the cutting head rotates up to 230 degrees to let you prune and saw at tough angles. The fully hardened, precision-ground blade stays sharp, and a low-friction, rust-resistant coating makes every cut easier. The versatile, rope-free tree pruner extends up to 12 feet to take down high branches without a ladder or make low cuts without kneeling or bending. The Pruning Stik Tree Pruner makes it easy to cut high or low with a level of control traditional pruners with exterior ropes can't match. A long, lightweight pole lets you cut high branches without the hassles and dangers of using a ladder, make low cuts without sore knees from kneeling or back strain from bending and easily reach into dense, prickly shrubs or tight spots. For the reach you need to cut your highest branches, the pole extends all the way to 12' and locks securely. The rope-free design means you can use both hands to maximize your power and accuracy, and an easy-to-grip sliding handle makes the pruning action smooth and simple. An actuating ball at the end of the pole lets you reach even farther and still prune with precision, an included 15" saw blade makes it easy to take down thicker branches, and the cutting head rotates up to 230 degrees to let you prune and saw at tough angles. The fully hardened, precision-ground blade stays sharp, and a low-friction, rust-resistant coating makes every cut easier. Fiskar's Pruning Stik Tree Pruner makes it easy to cut high or low with a level of control traditional pruners with exterior ropes can't match. A long, lightweight pole lets you cut high branches without the hassles dangers of using a ladder, make low cuts without sore knees from kneeling or back strain from bending and easily reach into dense, prickly shrubs or tight spots. For the reach you need to cut your highest branches, the pole extends from 7.9 ft. all the way to 12 ft. and locks securely. The rope-free design means you can use both hands to maximize your power, accuracy and an easy-to-grip sliding handle makes the pruning action smooth and simple. An actuating ball at the end of the pole lets you reach even farther and still prune with precision, an included 15 in. saw blade makes it easy to take down thicker branches, and the cutting head rotates up to 230 degrees to let you prune and saw at tough angles. Fully hardened, precision-ground blade stays sharp, and a low friction, rust-resistant coating makes every cut easier. Ideal for cutting high branches without climbing a ladder, extending from 7.9 ft. to 12 ft. making low cuts without bending or kneeling or reaching into dense or picky shrubs. Rope-free design gives you two-handed control and eliminates snags and tangles. Power-stroke chain-drive gearing provides maximum cutting power. Actuating ball at the end of the pole lets you extend your reach eve farther. Fully hardened, precision-ground steel pruning blade stays sharp, even though heavy use. Low-friction coating helps the blade glide through wood, prevents the blade from gumming up with sap and debris and helps the blade resist rust. Quick -release thumb lock provides easy adjustment of the cutting head angle. Lightweight aluminum pole weighs less than five pounds to minimize fatigue during extended use. Would absolutely recommend this product! This pruning stick is everything I was hoping for, and more. The ability to change the angle of the pruner is a great help, I like the pull-down stik as opposed to the rope type pruners and this one even extends. Well made and a great help for keeping me one the ground for pruning several fruit trees! I purchased this for my husband for fathers day. It was delivered very fast (excellent service). We have some vines in our yard that are growing out of control and my husband loves this product. I call it his "toy" . He is always cutting and pruning something in the yard. He loves it. It works exactly as stated and came ready to cut. I also helped in the yard by cutting back some unwanted trees. It is easy to operate and I feel safe using it since I do not have to go close to the little trees to prune them. Therefore, I do not have to worry about snakes, or what ever is hiding under the small trees (smile). I also love this product. I highly recommend it for anyone who loves to work in the yard. Thank you for having just what we were searching for. We've used this product before, and loved it because it has a long reach for pruning branches, but is lightweight and does not have ropes. The others on the market are just too heavy and cumbersome for me to use safely. When our last one had a stuck gear and we had to recycle, we could not find this version of Fiskars' pruners in any store in our area. Jet had it available, and we received our order within a week. I had the 5' version for years, and this one seems to be just as great. Remarkable how large a branch can be cut once you get the hang of it. This one extends to heaven. 1. Thank you for contacting Fiskars. Please contact our customer service dept at 866-348-5661 M-F 8-4:30 CST and they would be happy to assist withy your question.